UMKC is rich in history — and has its fair share of ghost stories. There’s an easy way to learn all about it via the Haunted UMKC Tour. 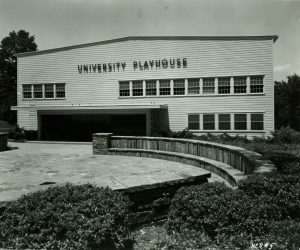 “There are two things for our school history that unite all UMKC students, and that is a vague notion that Disney drew the first kangaroo mascot and a collective certainty that Epperson House is haunted,” said Chris Wolff, founder and guide of the Haunted UMKC Tour and UMKC Bookstore Manager. Wolff is a UMKC history buff, alum and former adjunct professor. His desire to strengthen community within campus life encouraged him to develop the Haunted UMKC Tour. 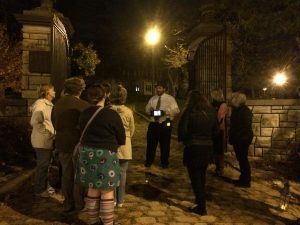 Wolff says that this is where the idea of hosting the Haunted walking tours came from. “What I found was that there were many people at the university that wanted to know more about the history of UMKC but didn’t know where to go to learn,” he said. He began giving themed tours around campus a few times a month. Some would focus on general history, some on the names of the buildings, and one that focused on student protests that have happened on campus over the years. “In the fall of 2014 I decided to do a tour where I told all of the campus ghost stories, and this became the Haunted UMKC Tour,” said Wolff. Wolff says that tour goers can expect tales of murders and mayhem, as well as some ghost stories. “Whether you believe in ghosts and the supernatural or not, most people love hearing stories about it,” said Wolff. Particularly stories about the Epperson House. “People flock to the tour to learn more about Epperson House,” said Wolff. And for good reason. The Epperson House tales include stories of lights mysteriously turning on inside the empty house. Wolff recalls giving a tour and recounting these stories, just as something strange happened. “At just that moment, a light turned on inside the [Epperson] house,” said Wolff. Luckily, Wolff’s wife happened to be on the tour that night and snapped a photo of Wolff right as the light came on in the house. Wolff’s Haunted UMKC Tours will run throughout October, with some dates and times TBD. The first tour is Monday, Oct 1. Tour goers should meet at 6:15 p.m. in front of the south entrance of the Student Success Center. Wolff will also be giving a UMKC Haunted Tour for UPB on Oct. 16 from 6 p.m. to 7:30 p.m.
Students must RSVP through RooGroups for the UPB tour as the event has limited availability.